It’s now been over three months since I took possession of the 2019 Yamaha YZ 450FX and I’ve been able to ride it in many different conditions. Mostly it has been used as my trail bike in the Southern California desert and mountains, but I have also raced it at a local District 37 Sprint Enduro more recently. Luckily, we’ve had a wet winter down here, so needless to say there’s nothing much better than wet dirt and an off-road 450. Overall the FX has been a fun bike to ride and has proved itself quite versatile in different terrains and scenarios. 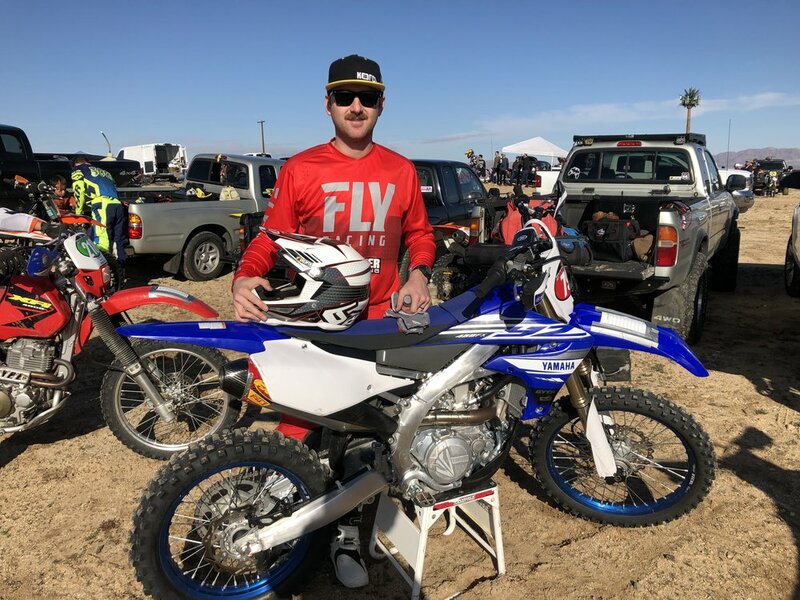 Here are some of the experiences I have had with the 2019 Yamaha YZ450FX. Being that the FX is designed as a “closed course” off-road race bike it’s naturally made to be more aggressive than the WR trail bike which has a VERY soft and mild mannered engine character. Although the FX is more moto related than a trail bike, that doesn’t mean that it can’t be tamed down, tailored to the rider’s skill level, and preference of riding. Yamaha now offers their power tuner app for any smart phone, which gives you the ability to load pre-set maps into the bike as well as giving you the ability to tailor your own maps. One thing that I am often asked is if the YZ450F maps will work in the FX and sadly the answer is “no”. That being said, there are plenty of FX maps out there to make your FX more aggressive and feel like a moto bike (see images for maps). Only two maps can be downloaded to the bike at one time and can be switched between the two on the fly. Personally, the two maps I like to have in the bike are “mild power” and “MX power feeling”, this gives me the ability to tackle different types of terrain and have a map that works fairly well in either faster or slower conditions. The mild power map richens up the bottom end and really helps the bike in tighter conditions where a lot of 450s are prone to flaming out. Although the mild map is really good, when riding a gear high in slow conditions the FX still benefits from having the rider cover the clutch just to make sure stalls are kept at bay. The more aggressive maps for the FX really make the bike feel just a touch off from the YZ450F with a very hard and aggressive hitting power that is great in faster, sandier conditions when you want the most power available. Having the app on your phone is genius and I would bet the other manufacturers will follow suite in coming years. I almost always have my phone on me when riding trails, so it’s really convenient to be able to try a different map when taking a trailside break (the app doesn’t need mobile service to change maps as long as you have them loaded on your phone). Over time (20 hours) the YZ450FX’s suspension oil/bushings had slightly broken down, which has made the damping feel a little softer than when the bike was new. I think for my weight (180 pounds) the spring rates are slightly soft when riding at a race pace (A Level), but at a trail pace the suspension settings are quite comfortable. The main places that the suspension is soft is when riding aggressively through large whoops and g-outs. The feeling I get (in those conditions) is a sensation of the fork and shock blowing through and riding slightly too low in the stroke. At the District 37 Sprint Enduro I had to check up more than I would like for g-outs because the fork and shock would bottom and it would make my feet/pegs hit the rocks in the bottom of g-outs. Stiffening up the compression on both ends of the suspension helped hold up and only minimally effected small bump absorption. This newer model FX is a better cornering bike than the previous generation by having the ability to change direction with less rider input. It may be partially in my head due to the slimmer feeling bodywork, but the newer model also feels slightly less top heavy and overall more nimble. The engine braking is much more friendlier in 2019 and ride attitude on/off throttle is much better. NOTE: Using the “MX Power Feeling” map creates less engine braking than the other maps. The FX’s engine (in stock form) is very capable and doesn’t need much of anything to be really competitive in a race situation. The only aftermarket piece we have added to the FX is an FMF 4.1 slip-on, which was mostly needed to make the bike legal for off-road racing, since the FMF comes with a spark arrestor. The FMF took away the somewhat raspy sound that the stock muffler puts out and replaced it with a deeper tone that was slightly louder. The FMF system also helped mid range power, but slightly smoothed out the bottom end. I didn't mind the newfound delivery as the race was super technical and rocky, so having that smoother RPM response was fine for me. We will have more on the FMF 4.1 slip on system for the 2019 YZ450FX in another separate article. In terms of durability, I have only had two issues….. One is that the 2019 FX does NOT like to start when in gear. This doesn’t sound like that big a deal, but when it comes to races with dead engine starts this can become an issue. Also, when out on a long trail ride, in more extreme terrain, I had the battery die on me from starting and stopping frequently. With no kick start back up, I was lucky enough to be on a hill and could bump start the bike fairly easy. Once down the trail and riding a few miles, the battery would generate enough voltage to start the FX (although turning over slowly), but once the bike sat in the garage for a week, the battery lost all voltage and had to be replaced. The only other issue that I had was a blown fork seal on the caliper side. After talking with Travis Preston from Yamaha, he said that there were no nicks on the fork tube, but it could have been that the forks twisted in a small crash (I may have had a few of those) and upon compressing the front suspension, with misaligned forks, it damaged the seals. So if you ever have a crash that twists your handlebars, make sure to loosen the front end (fork pinch bolts, axle nut, etc.) completely before going back on your next ride. It’s no shocker that Yamaha built a great machine and I think we can all agree it’s a good thing that it’s not just the Europeans building great off-road/hybrid machines. In the future I’d like to race the FX at a few more local races and possibly try some stiffer spring rates, give you guys some added suspension specs, and work on even better maps for technical riding. After all, I need to do something to get better than a third place in the vet class (Kris says that’s not acceptable). Keep an eye out for a review on the FMF 4.1 muffler in the coming weeks over at Keeferinctesting.com and feel free to reach out to me at Michael@keeferinctesting.com if you have any questions about the 2019 Yamaha YZ 450FX.